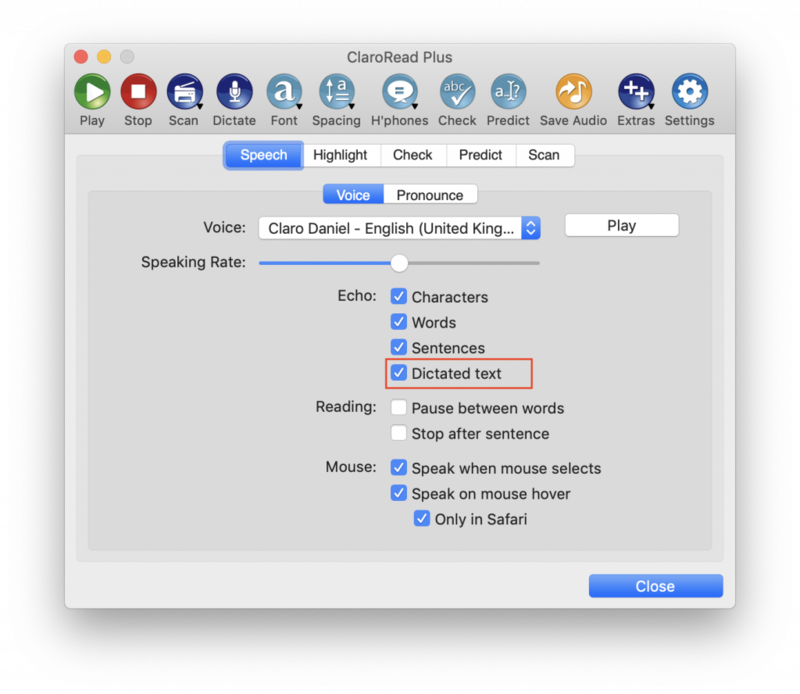 ClaroRead Mac 7 now includes a Dictate button which activates the macOS dictation feature. Once you’ve finished dictating your text, click the Done button and ClaroRead will automatically read back your dictated text from Microsoft Word, Pages or TextEdit. Our homophone data has been updated to include example sentences with each definition. As always, we’ve been improving ClaroRead along the way, with minor tweaks and fixes. Mac OSX 10.11 or above. 920MB hard disk space (ClaroRead Standard and Plus). 620MB hard disk space (ClaroRead SE). Plus 200MB-650MB for each voice. Microsoft Word 2016 or later. ClaroRead Mac 6.4 is compatible with the new Dark Mode in Mojave. See Apple’s support page for instructions on how to use Dark Mode. ClaroRead Mac will display correctly on retina displays. Text in the Check window is now automatically read out when you hover the mouse over it. 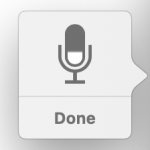 You can turn this off by clicking on the speaker icon. This matches the ClaroRead for PC behaviour. You will need to allow ClaroRead to access the programs it’s trying to read from (e.g. Microsoft Word). ClaroIdeas included with ClaroRead as standard. Language profiles allow you to switch between Swedish and English settings and resources (like voice and homophones) easily. Compound word checking with ClaroStava. The next version of macOS (after High Sierra) will only support 64-bit applications. ClaroRead Mac 6.2 is now a 64-bit application, so ClaroRead and its Extras are all ready for that change. There are common words, such as “you” or “I”, which are homophones, but you probably never get them confused with the alternatives (like “ewe” or “eye”). 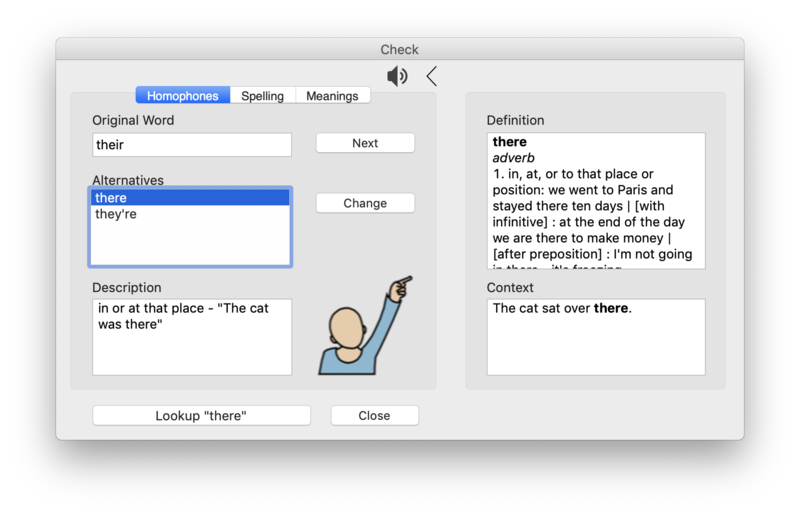 In ClaroRead Mac 6.2 you can now choose to ignore these kinds of homophones, so they don’t get highlighted when using the “Show Homophones” feature. Homophone and picture resources have been updated. Scan from screen now supports multiple monitors. The Settings window now opens and closes a lot quicker. 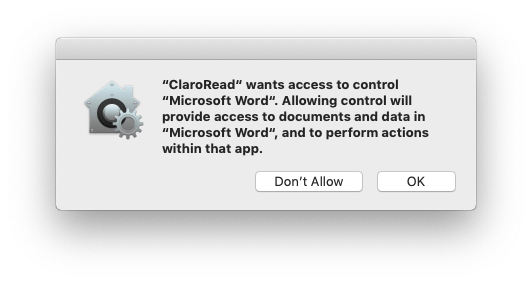 ClaroRead Mac 6.2 now accepts ClaroRead for Windows licence keys (V7). This means if you have ClaroRead for PC and change computer to a Mac, you can use the same licence key to unlock the Mac version. ‘Scan from Paper’ process improvement – Rather than launching Image Capture, Scan from Paper now launches a scanner window for you to complete your scan and converts the scanned image immediately into the format and location of your choice. Mac USB Creator – You can now use your ClaroRead Windows or Mac key to download and make your own version of ClaroRead Mac on a USB drive. This is a great way to transport ClaroRead around to use on shared computers which might not have it installed. Using the Scan button in ClaroRead Plus now remembers where you scan from, to, and the document format. Great for batch converting. The help file is updated to reflect scanning changes. International versions of ClaroRead are now fully translated. You can now access ScreenRuler’s Preferences window directly from its dock icon. Other minor fixes and interface updates. November 2017 – updated Scan2Text to version 1.1.9. Fixes an issue on High Sierra where you couldn’t select the output document format when scanning from paper. A New Integrated Optical Character Recognition (OCR) engine – ClaroRead Plus Mac now includes its own integrated Optical Character Recognition engine which gives you the rapid Scan from Screen function to capture any inaccessible text, as well as quickly converting scanned files to accessible PDF, Word and text files. New Scan from Paper * feature – you can now quickly launch the MacOS Image Capture app and immediately get to scanning in physical documents and creating accessible, digital copies of them using “Scan to ClaroRead”. New Scan from PDF/File * feature – using the new Scan from PDF/File feature you can convert PDF or image files to fully accessible formats, so that ClaroRead can then read aloud. You can also scan inaccessible files and create editable output formats, such as DOCX. Supported output formats are PDF, DOCX, TXT and RTF. New Scan from screen feature – with the new Scan from screen feature you can select an area of the screen to be read with your mouse and ClaroRead will quickly and accurately scan your chosen area and read it aloud. You can now instantly read anything on your screen as well as copy it to the clipboard. Launch ClaroRead with PDF and image files. ClaroRead now supports opening of PDF and image files directly, so you can choose a PDF/image file, right-click and select Open With, choose ClaroRead and it will launch ClaroRead and start the file scanning process. New extra app – ClaroSpeak. ClaroSpeak is a supportive reading and speaking app that read PDF files, Microsoft Word document, text files and more, aloud, with synchronised highlighting. When you open a document in ClaroSpeak, the text of the document gets copied in to the ClaroSpeak window and then you can also edit any text. ClaroSpeaks built-in text prediction and echo features can help you maintain accurate typing. Fixed an issue that could cause text in Microsoft Word documents to be removed when speaking them and quickly moving/switching between different documents. Fixed an issue where some prediction items were being spoken twice. (5.4.0) ClaroRead Mac now works with Acapela voices. (5.4.1) ClaroRead Plus Mac works with (and now ships with) Readiris Pro 15. Fully compatible with the new Mac OSX 10.11 El Capitan operating system. Compatible with Mac OS X 10.10 (Yosemite) as well as previous Mac OX versions from 10.7 onwards. ClaroRead Mac 5.2 now uses the latest Nuance Expressive voices. Unfortunately this means previous “Claro” voices (Nuance Automotive ones) will cease to work. You can download (for free) any of the new voice range from within ClaroRead, just go into Settings and select “Download more Claro voices” from the voice selection list. Run ClaroUp, our app updater from within ClaroRead. Select ClaroRead > “Check for updates” from the menu. Download and install any of the available 82 new Claro voices by selecting ClaroRead > “Download more Claro voices” from the menu. Uninstall any Claro voices by selecting ClaroRead > “Uninstall voices” from the menu. The user interface has been redesigned and improved with usability in mind. In the Thumbnail View you can easily rearrange the pages by drag-and-dropping them. In the Regular View you see the current image that is analyzed. The page thumbnails are displayed on the left, in the Pages panel. The documents you process with Readiris can be sent to several online Storage Systems: Evernote, Dropbox and GoogleDocs. Readiris now automatically detects if images have been made by a digital camera, and allows you to correct their perspective. This way you can deskew documents that were photographed from an angle. Pages Integration – Includes synchronised highlighting using the Play button and homophone checking. Nuance Vocalizer voices – ClaroRead Mac 5 now installs the same voice selection as on Windows. Definition and context information added to the Check window. Spell check anywhere – ClaroRead will spell check any text in any program. Select the text you wish to spell check and click Check. (4.3.2) ClaroRead Mac now works with Word 2011. (4.3.3) Translated into Dutch. Danish translations updated. (4.3.3) Dictionary images updated to match ClaroRead PC’s set. ClaroRead Plus Mac is now shipped and integrated with Readiris Pro version 12. New Scan tab in Settings – This allows you to configure the way ClaroRead works with Readiris. See this help page for more details. The new focus sentence feature greys or dims out sentences in MS Word not being spoken by the ClaroRead voice. This is helpful for focusing the eye on the text, and also tracking the position in a document. The Word Trail feature makes words colour progressively as they are spoken by ClaroRead. This mode allows effective word by word highlighting, with minimal visual disruption. Any colour can be chosen to highlight the text. The new ClaroCapture program included with ClaroRead Mac 4 can collect text from any document and web page, grouping it as a project file. The research file can be sent to Microsoft Word or PowerPoint. It can also extract highlighted text from Word documents. A great study skills tool. ClaroRead Plus Mac 4 now comes with a Scan button to launch the Readiris Pro 12 OCR software. The highest quality Optical Character Recognition is now included in ClaroRead Plus, making it ideal for scanning or converting books, articles and other content to become accessible, readable and editable. The Check window now integrates homophones, spelling suggestions and meanings in one window whilst working in Microsoft Word. There is also a Dictionary Lookup button which grants direct access to the Mac?s Dictionary. Any spelling corrections made in the Check window are remembered, and can be reviewed later under the Check tab in the Settings pane. This information can be used to build a personal correction list which inserts the personal corrections above all others in the Check window. ClaroRead Mac 4 now comes with ScreenRuler. ScreenRuler provides an on-screen reading ruler that tracks the mouse pointer to help focus on a particular area of the screen. 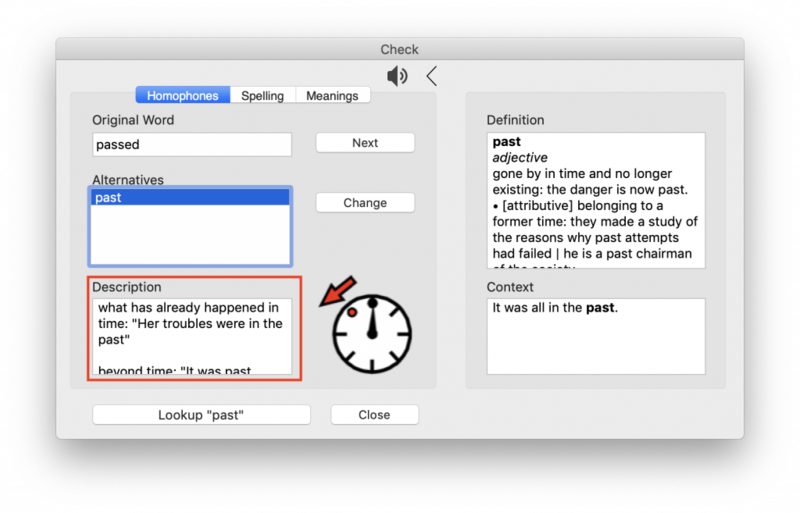 ClaroRead Mac 4 now includes a Word Prediction function which learns as the user types and can be trained from Word documents or the clipboard. There are a range of different settings for customisation under the Prediction tab in the Settings pane. The Extras button on the toolbar includes other software applications bundled with ClaroRead including ClaroView, ScreenRuler and ClaroCapture. There is also a link to the Mac?s calculator giving quick access to the application. ClaroRead Mac Help Files and User Guides.